Blend avocados with basil for an alternative to traditional pesto. Stir through pasta for a meal that's ready in only 20 minutes. Cook the pasta according to pack instructions, then partially drain, leaving about 3 tablespoons of the cooking liquid. Cover the pan to keep the pasta warm. Meanwhile, make the pesto: cut the avocados in half lengthways and discard the stone, then cut each half into 4 wedges and peel off the skin. Place the avocado, garlic, lemon juice, herbs, chilli, olive oil and half of the cheese in a food processor. Blend until smooth. 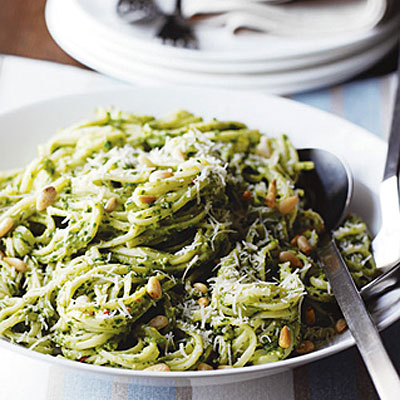 Stir the pesto into the pasta, then divide between 4 bowls. Serve immediately, sprinkled with the remaining cheese, pine nuts and freshly-ground black pepper. Make the avocado pesto just before serving to prevent any discolouration. If making for non-vegetarians add bacon pieces to the pasta.